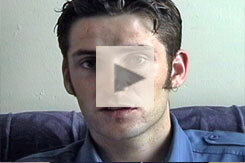 Paul Cunningham talks about the Turas and demonstrates the rounds at some of the Stations (1998). At the western end of Co. Donegal’s Slieve League Peninsula, Gleann (as it’s known to locals) was described by John O’Donovan in 1838 as “the extreme brink of the world, far from the civilization of cities, and the lectures of the philosopher.”2 Now, with the M3-N3 routes connecting Dublin to Cavan, one can travel from the center of the capital to Gleann Cholm Cille in less than four hours. 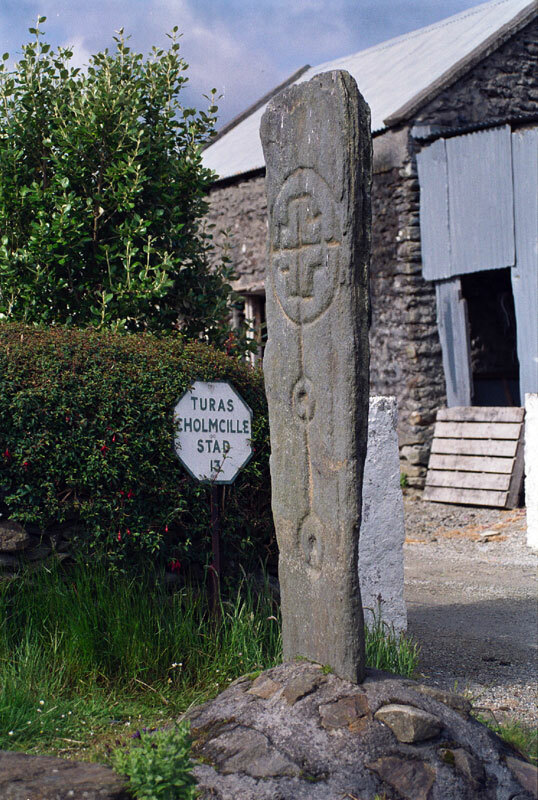 The history of the Gleann Cholm Cille (Glencolumcille) Turas is discussed in some detail on our other page devoted to this site. 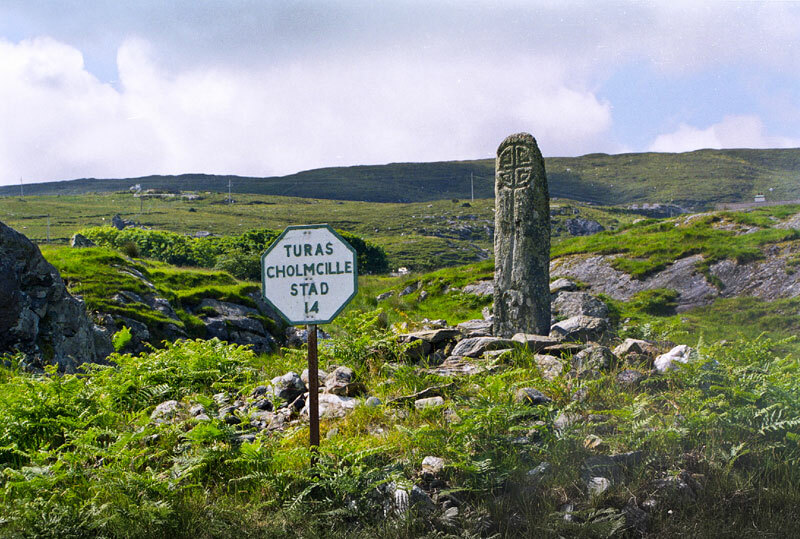 Turas Cholmcille is performed (by its purists) trekking barefoot, starting just after midnight as June 9th begins. Walking for five and a half kilometers (3.5 miles), the pilgrims visit 15 stations and perform specific prayers and devotions at each. The stations are mostly decorated cross-slabs set into rough rock cairns. These slabs, composed of schist, have crosses and other design elements cut into them. A few of the slabs, at the west end of the valley, have been shaped into rudimentary crosses. 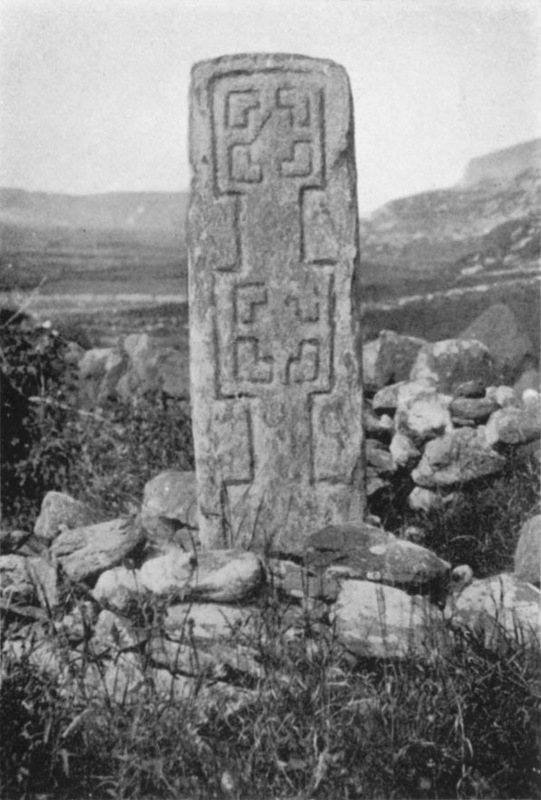 The cross-slabs can be divided into two groups, with those in the east, closer to the town, showing more elaborate decorations, some of them similar to that of eighth- or ninth-century metalwork. 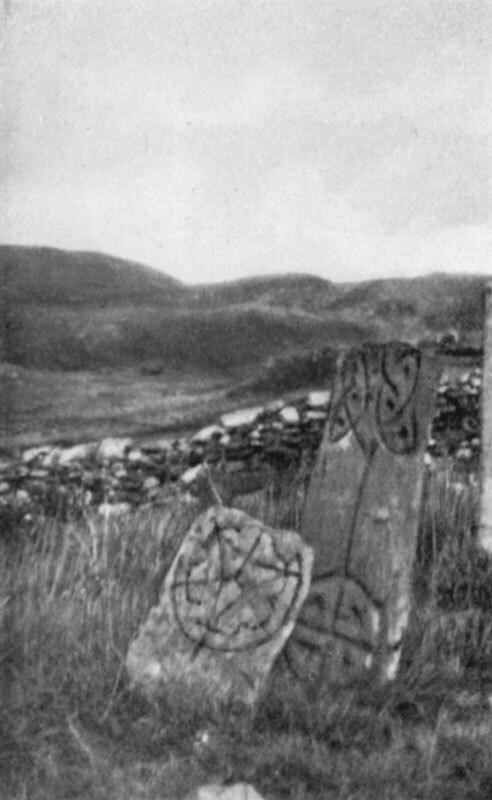 The slabs found in the stations of the lowland areas and the hills to the west of town have markings that are more rudimentary, cut into the stones as simple outlines. 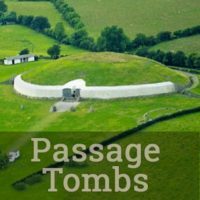 As the stations are visited in turn, each is circled three times in a “sunwise” direction (deiseal) so that the station is always to the right as the pilgrim makes a clockwise circuit from east to south to west to north around each monument. Until the pilgrim begins the walk down the hill to Station Seven, the only words spoken should be in prayer. 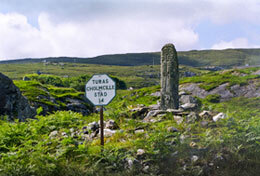 The stáisiúin (stations) of the Turas are presented here in numerical order, which is replicated in the Virtual Turas on this site. 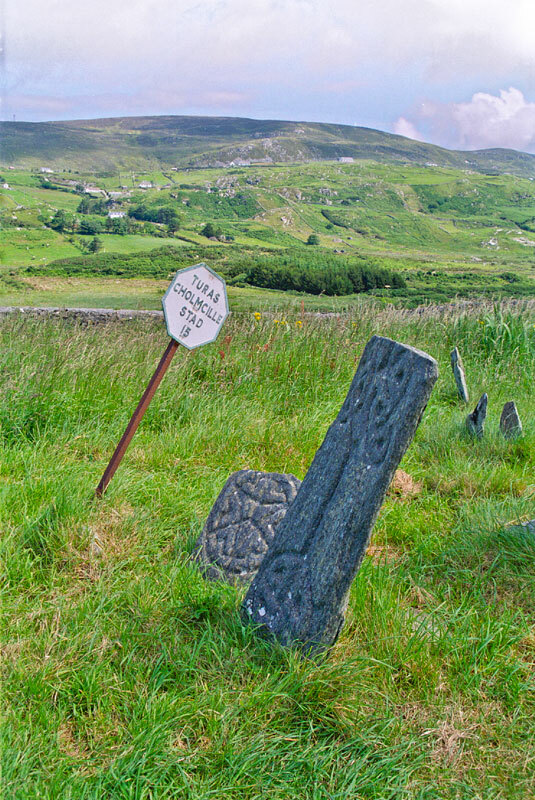 In traditional Gleann Cholm Cille community life, however, the stations were referred to by their names, not numbers. And in walking the Turas the villagers would begin at whatever station was closest to their homes. The station numbers that are used in Voices from the Dawn may not always be consistent with signage or with other sources of information. The numbers used here were determined by consulting with authorities in Gleann Cholm Cille who study traditional practices and by seeking out those who carry on the traditions locally. There was once more than the one Turas in this little valley. There were other journeys up and down the nearby hills to commemorate the lives and works of other local saints. These practices have now been lost forever, fading first into a dim folk memory and then into but a sentence in a dusty book.3 The Turas of St. Colm Cille was the one that survived. We are fortunate that it did, as otherwise we would never have had the opportunity of sloshing through the fields in the pouring rain at midnight on the eve of June 9th, 2001, holding an umbrella in one hand and a night-vision camcorder in the other. This Turas was not saved by good fortune alone. When Liam Price came here for his research in 1940 he sought the help of local folklorist Seán Ó hEochaidh, who led him to the recollections of an old woman named Peigí Mhór ni Ghadhra. Thus some of the traditional lore was committed to paper.4 When Fr. 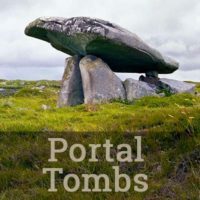 James McDyer encouraged archaeologist Michael Herity to come here to do his field research and then publish his Gleanncholmcille guidebook in 1971, he set in motion a process that today continues with religious, cultural, and archaeological tourism. 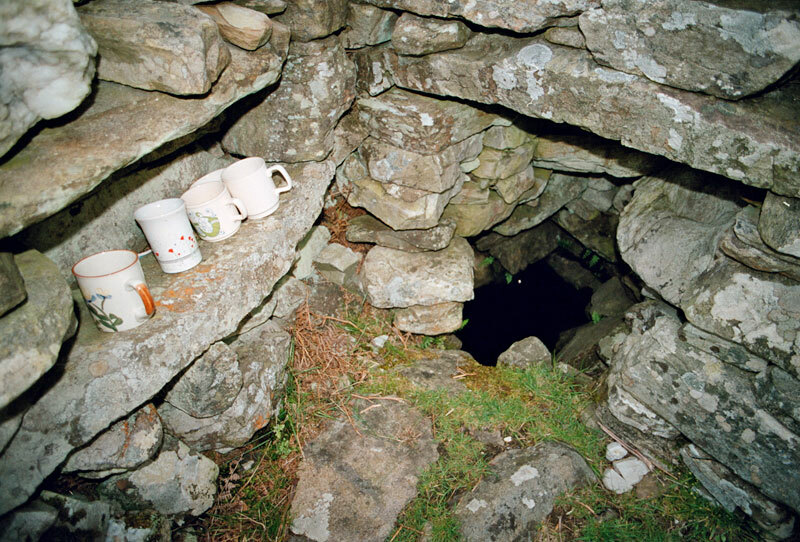 These have guaranteed a steady stream of visitors eager to walk these sacred ancient paths. Many of them are the enthusiastic Irish-speaking students attending classes at the Oideas Gael Irish language cultural center in town. Like Fr. 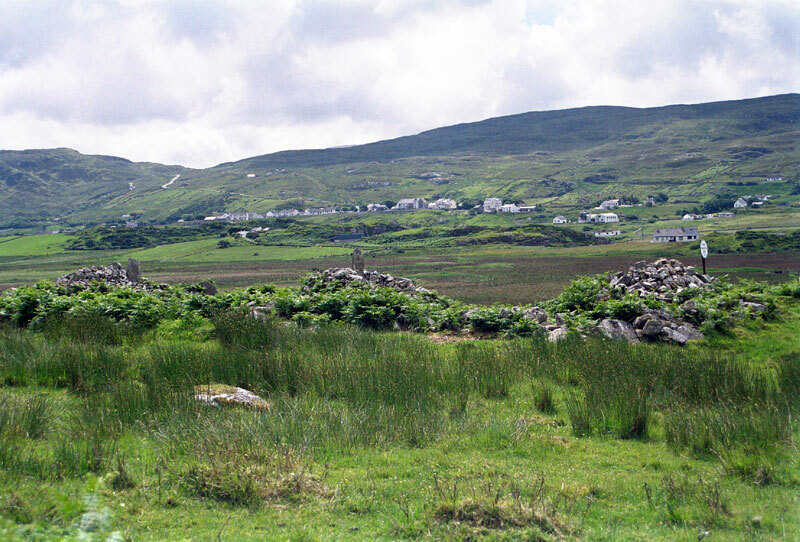 McDyer’s Folk Village, these students, and all who walk the Turas paths, are part of the living tradition in this sacred landscape of St. Colm Cille. “Man looks with veneration upon every spot that has been hallowed by sincere religion…and feels anxious…to preserve every trace by which the turas of the pilgrim and the progress of the human mind in art, religion, or enthusiasm can be followed. In the gallery below are black and white photographs of some of the cross-slabs. These images, taken from a 1941 journal article,6 show the inscribed designs with more detail than is evident in some of our contemporary images. This may be due to erosion that has occurred in the stones during the intervening 70 years. Or, it may also be possible that there was, in the earlier images, some retouching of the negatives to help delineate the inscriptions. 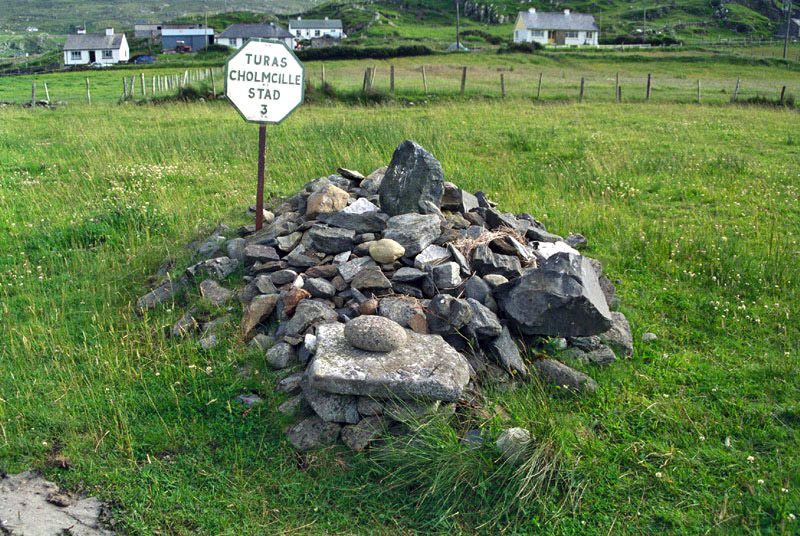 The first station of An Turas is built right into the west retaining wall of the graveyard of St. Columba’s Church (Church of Ireland). 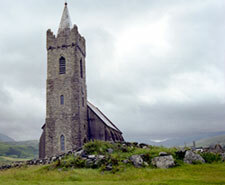 It is possible that this church, built in 1828 to replace an earlier Protestant structure, stands on land where there was an early-Christian monastic enclosure. But four thousand years before that, this spot was where a group of Neolithic farmers built a megalithic Court Tomb. This place, therefore, has been considered sacred for thousands of years. It is possible that stones from this 10-meter (33-feet) long monument were quarried and used in the construction of monastery buildings or churches at this site.8 At the west side of the ruined tomb is a small place for the pilgrim to kneel. The pilgrim then walks two fields to the west, to the next station. While walking between the stations of the Turas, the fifteen decades of the rosary are recited. These prayers must be completed three times before reaching the final station. Turas Station Two. Click on the image. Then drag to rotate it 360°. Turas Station Two, from below. One hundred meters (328 feet) west of Station One there is a 1.85-meter (six-feet) high cross-inscribed schist stone pillar standing at the top of a small but prominent rock outcrop. Beneath the pillar are the remains of a leacht, a dry-stone altar. Probably the best known and most photographed of all the Turas monuments, its two broad faces contain designs including three ornamental panels on the east face and a four-part design on the west face. The ornamental panels may be viewed in detail in the virtual-reality object to the left. Click on the image, then drag to rotate the pillar after the new window fully loads. 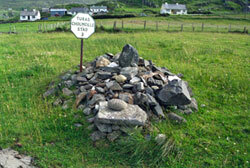 At one time this stone marked the western limit of An Turas, before the stations up on the mountain—Colm Cille’s Bed (Station Five), and Well (Station Six)—were added.10 The pilgrim circles three times sunwise, then climbs up to the stone, kneels, and says five Our Fathers, five Hail Marys, five Glorias, and the Creed. This small cairn, 1.2 kilometers (.75 mile) north-west of the previous station, measures 2.9 meters by 2.2 meters (9.5 x 7.2 feet). Formerly there were three rounded stones waiting for the pilgrims. 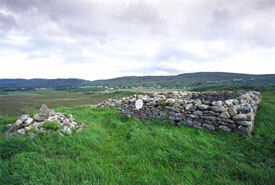 Áit na nGlún refers to the depression in the earth where the pilgrim kneels, just west of the cairn. 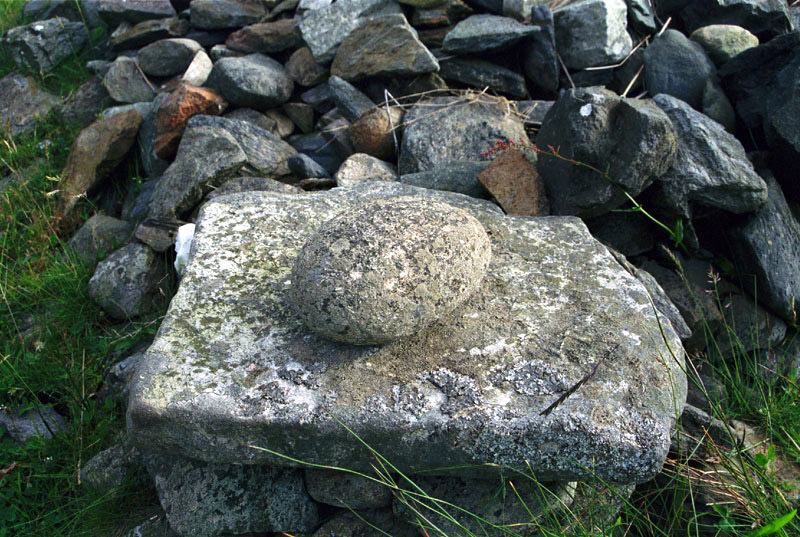 This stone altar, 400 meters (1,312 feet) north up the hill from Station Three, sits within a circular dry stone wall with a diameter of 10.75 meters (35.3 feet). This may have been the remains of some sort of prehistoric monument.11 Between this Station and the next is a small circular structure, apparently the base of a small hut. The entrance of the enclosure points to the east. Atop the leacht is a meter- (3.28 feet-) tall rock slab inscribed with a weathered Latin cross. The pilgrim makes the three rounds here, while reciting five Our Fathers, five Hail Marys, five Glorias, and the Creed. The name given for this location, Mullaí na Croise (“Height of the Cross”), encompasses both Stations Four and Five. The pilgrim circles the chapel three time, clockwise, while praying. After the third time he enters the building and lies down on Colm Cille’s Bed. He then rotates his body while horizontal, always turning first onto the right side. From underneath the Bed the pilgrim may take a handful of clay, which is supposed to prevent fires in the home and provide a cure for headaches. 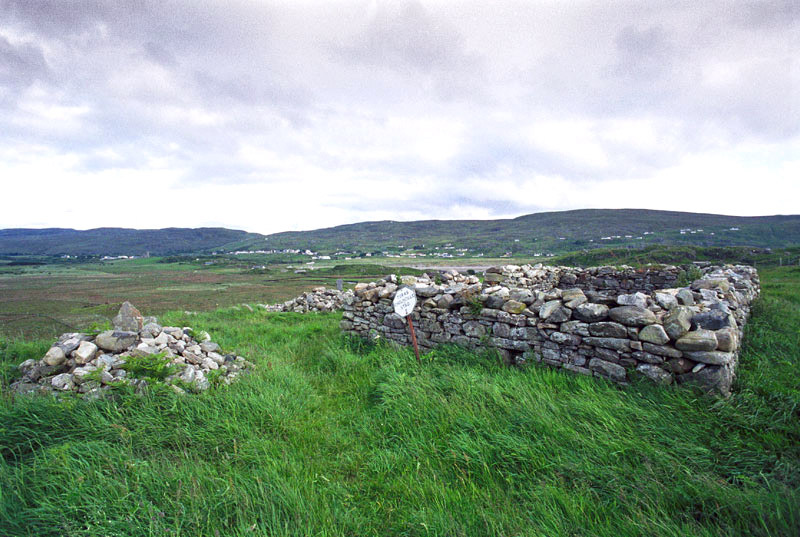 There are also three eroded cross-topped cairns inside the circular enclosure. 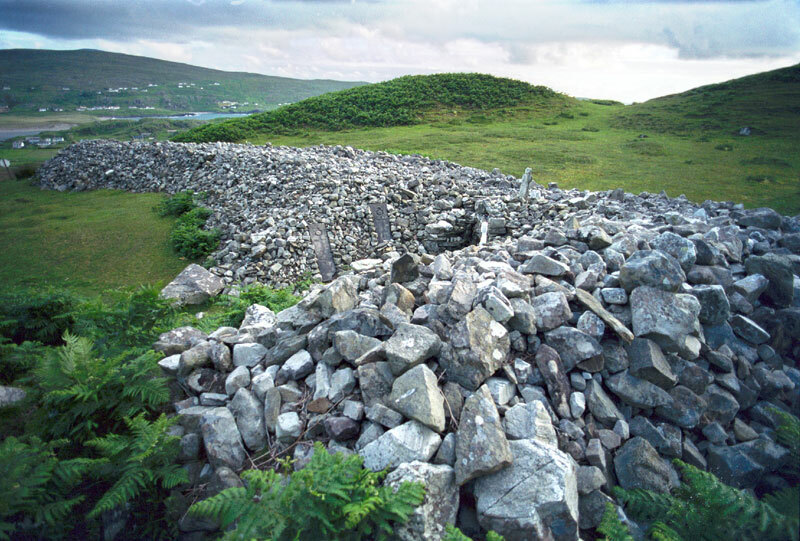 Each of the cairns is thrice circled during An Turas, the pilgrim saying the Creed, five Our Fathers and five Hail Marys. 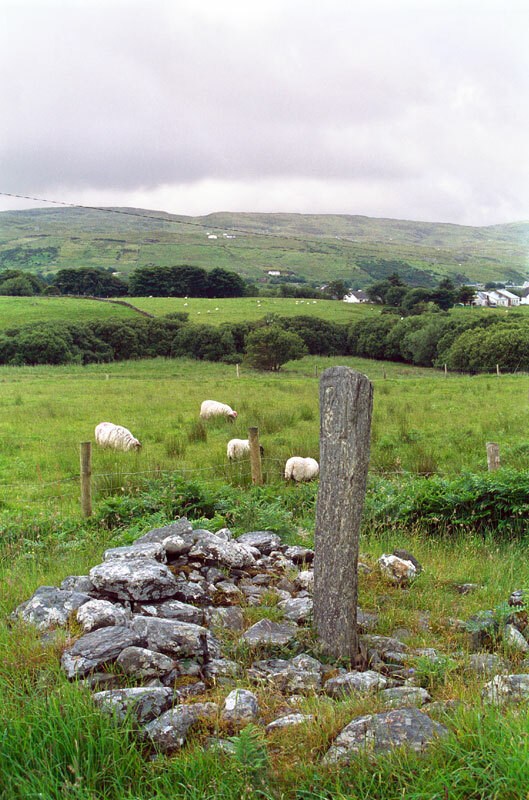 After leaving this stone, the pilgrim is supposed to proceed around the bottom of Mullacb na Croise, keeping the Chapel and the cairns on the right as he proceeds to the next Station. To reach Station Six, the pilgrim must climb up a steep hill, carrying with him three stones gathered at the bottom of the hill. 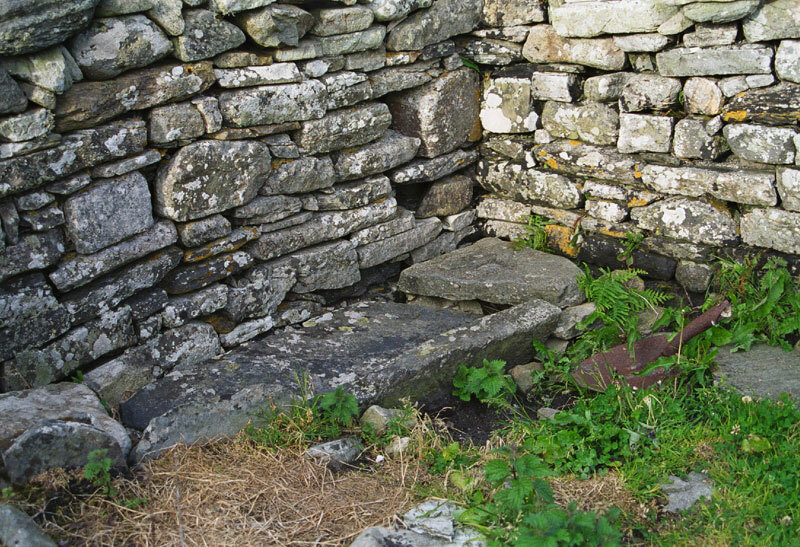 Midway up to Colm Cille’s Well there is a natural rock outcrop in the form of a seat. 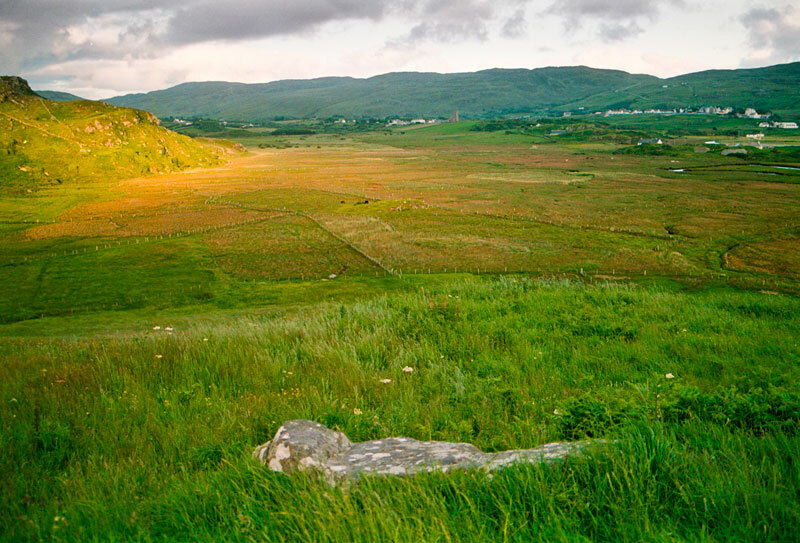 This very logical place to sit and survey the valley panorama below on a fine day is called Colm Cille’s Chair, as the faithful believe that the saint himself once rested here. 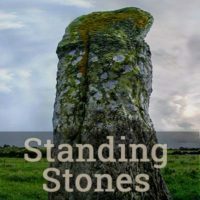 Proceeding up to the cairn containing the well, the pilgrim circles it three times, each time depositing on the immense curved 30-meter (100-feet) pile one of the stones carried up the hill, thus doing his part to extend it a bit. While making the rounds, ten Our Fathers, ten Hail Marys, ten Glorias, and the Creed are said. Afterward, one should kneel at the recess of the well, genuflect, and drink from the water, using one of the cups provided. The pilgrim should first spill three drops from the cup, in the name of the Father, the Son, and the Holy Ghost. Often some water is carried away in a bottle, either kept by the pilgrim or sent off to someone in need of a cure. 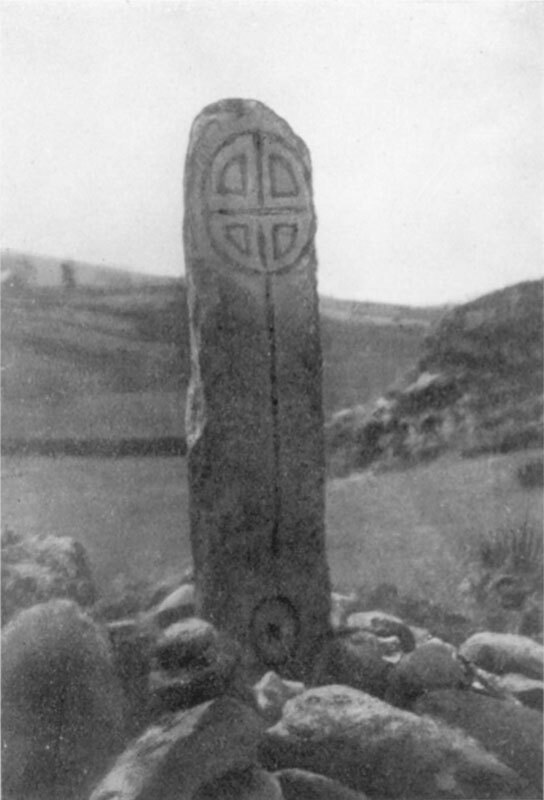 In a 1941 report it was noted that, “no stopper should be put into the bottle but one of the grass which is growing round the well.”13 Above the well is a 92-centimeter (36-inch) rough stone cross, with incised designs. There is a modern statue of a saint to the side of the well. 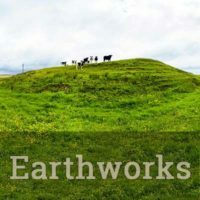 Down the hillside, 400 meters (1,312 feet) from Colm Cille’s Well, there is a D-shaped dry-wall enclosure which contains three cairns, with upright cross-slabs. Pilgrims circle each of the cairns three times, while reciting the Our Father and the Hail Mary each time around. 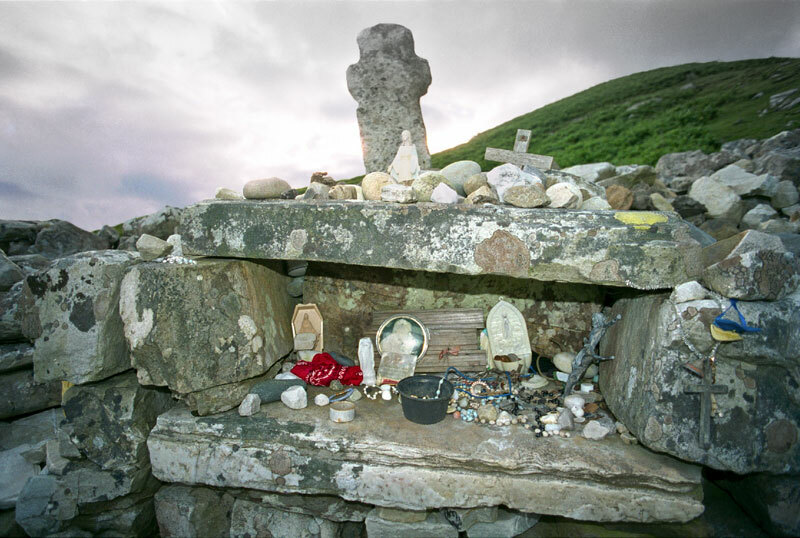 At one of the cairns there was a flat stone which, to cure a sore throat, the pilgrim would raise up to her chin. The western cairn has a slab set deep within its base, with only 70 centimeters (27.5 inches) visible above the base. 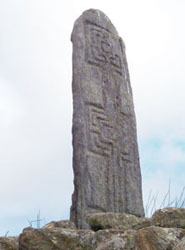 There is an outline of a Latin cross incised on its north west face. 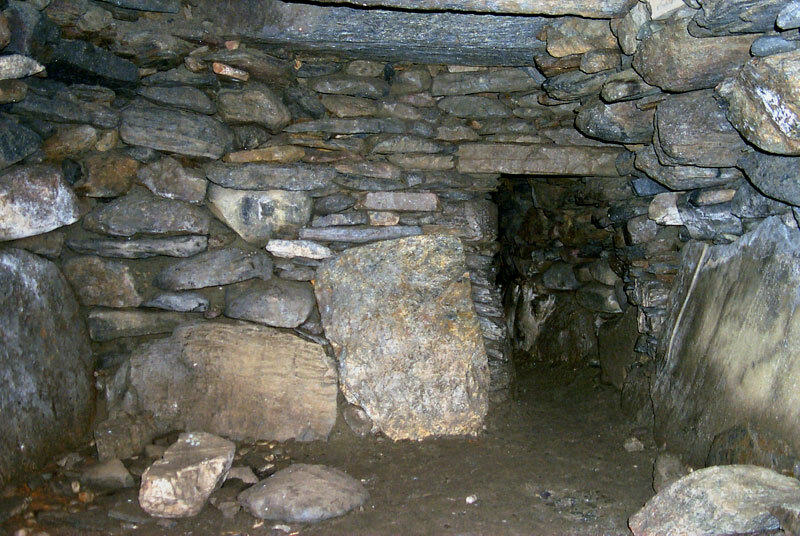 The central cairn is a leacht with a rectangular base that is 4.5 meters (18.8 feet) square. It has an entrance passage leading into its center. 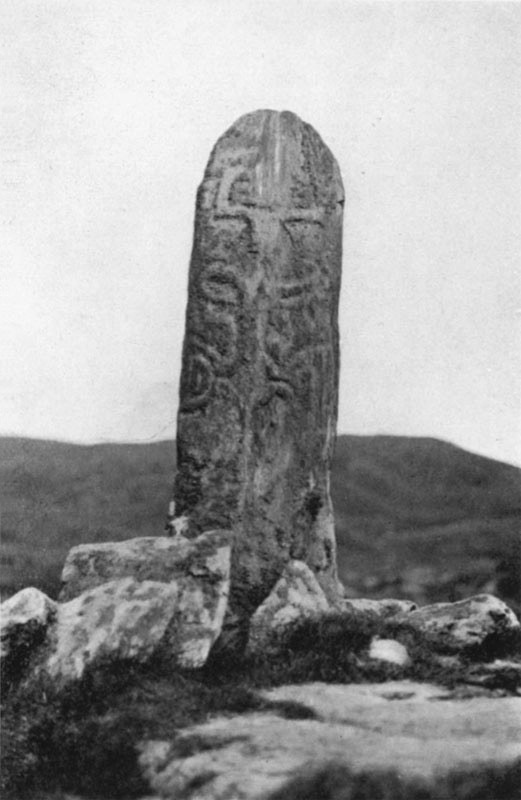 The eastern cairn, also a leacht with a rectangular base, has a rudimentary cross that is 85 centimeters (33.5 inches) tall. The left-hand arm of the cross was apparently broken off. 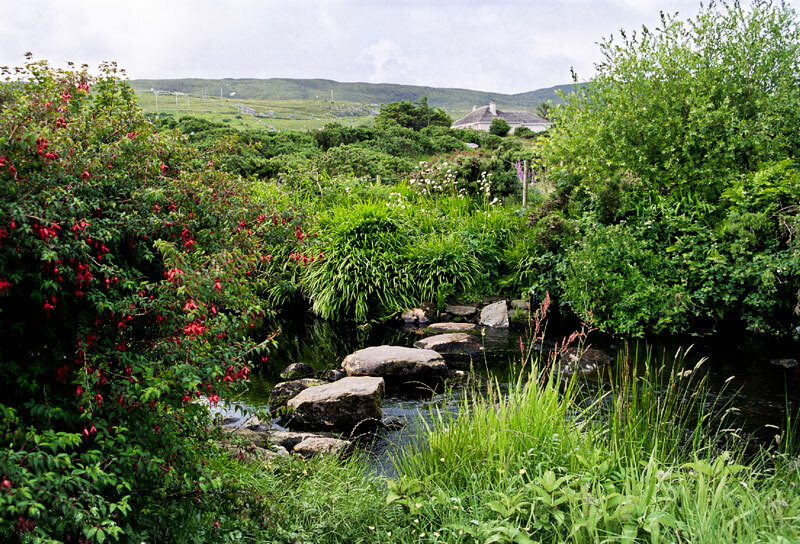 The path through the bog can be inundated at flood tides; an alternative route to the next Station is to backtrack by roads. Station Eight is a beautifully inscribed cross pillar that is nearly two meters (6.5 feet) tall. It sits in a low cairn, with its decorated face turned to the pilgrims as they emerge from Abar Dubh. The design work includes three circular elements, connected by a vertical line. On the upper panel is a symmetrical cross, contained in a circle, with a perforation at its center. To see all the details, click on the black and white image to the right. Then, in the new window, click the “full screen” button. You can then use the controls to zoom in. 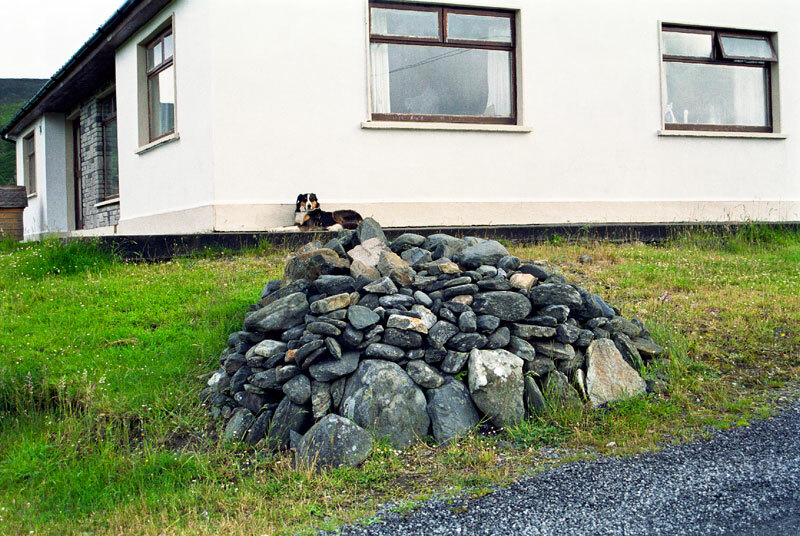 This cairn, which the pilgrim circles just as all the others, is an unimposing little pile of stones, lacking a pillar. It seems, in fact, to be a modern addition, with its stones missing the patina of age and the ornaments of lichen found on the other cairns. But that is only because the stones were recently moved away for safekeeping during the construction of the adjacent residence. 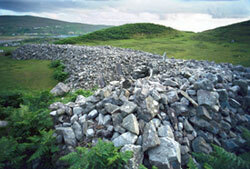 The cairn was then reassembled in its current location, which may be seen in the virtual-reality environment. 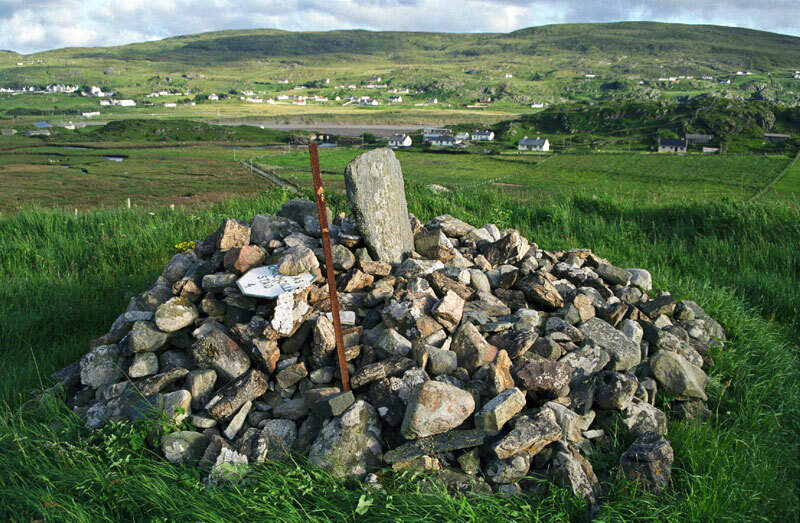 The image here shows the cairn before the construction activity. 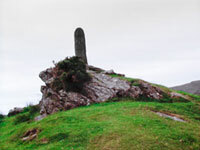 Within an eroded circular enclosure of approximately 3.7 meters (12.2 feet) in diameter is a flat-topped cross-pillar. This 1.6 meter (5.25 feet) slab retains its ornamentation on both faces. The design on its east side is similar to that on the east face of the cross-pillar at Station Two. 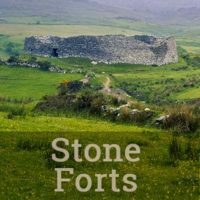 The name of this site, “The Townland of the Demons,” comes from the legendary battle fought here between St. Colm Cille and a band of demons, perhaps an allegory representing the struggle against the remnants of pagan practices in this valley. This story is recounted in our other Gleann Cholm Cille page. 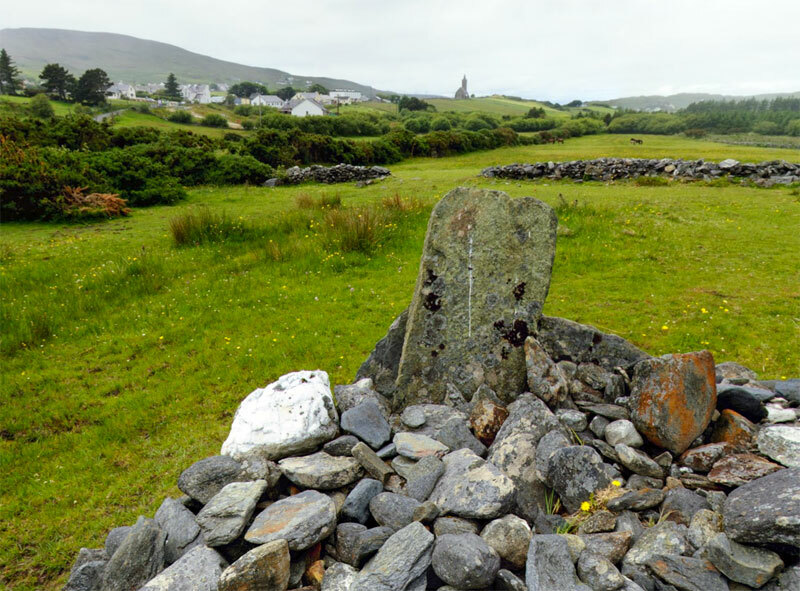 In 1941 it was reported that “the old people seldom called the townland Druim Ruadh; Baile na nDeamhan was the name all the old people called it.”22 Nearby is Poll an Chloig, “The hollow of the Bell,” where Colm Cille is said to have thrown his bell at the demons, chasing them into the sea. 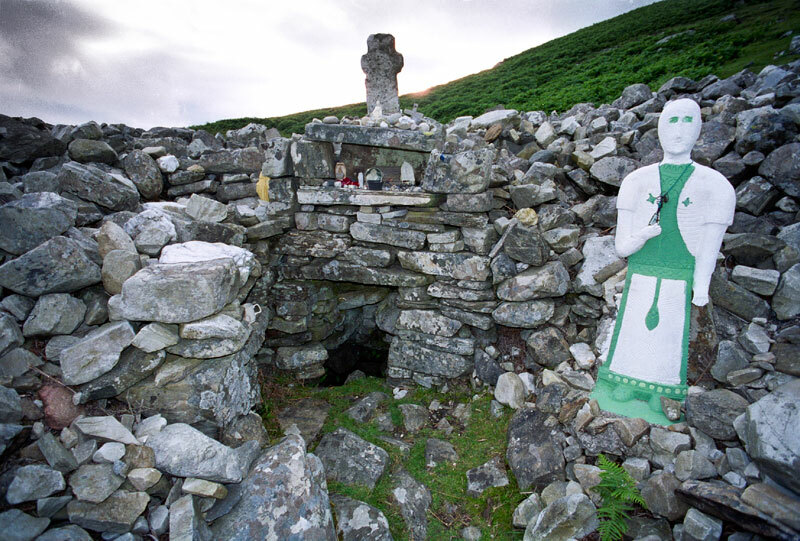 The pilgrim here recites five Our Fathers, five Hail Marys, five Glorias and the Creed while circling the cairn. 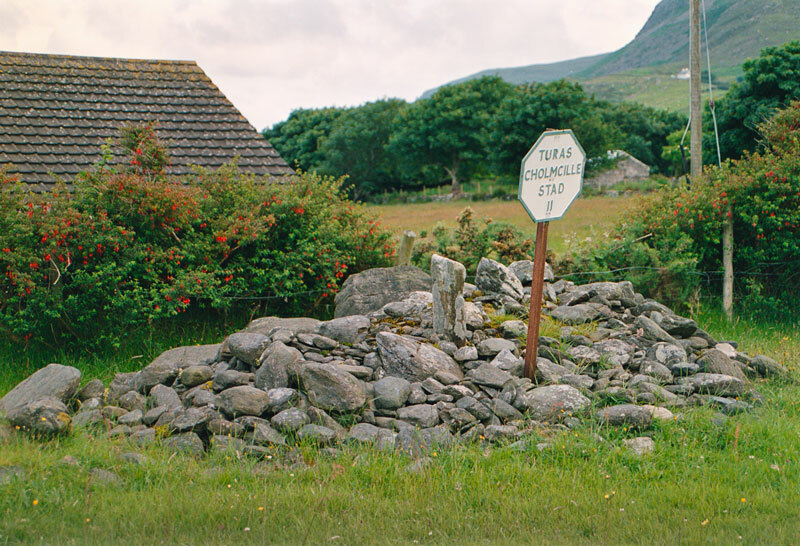 If there is any one station of An Turas likely to be seen by all visitors to Gleann Cholm Cille it would be this one, as it sits right on the main road, by a junction to one of the routes into town. 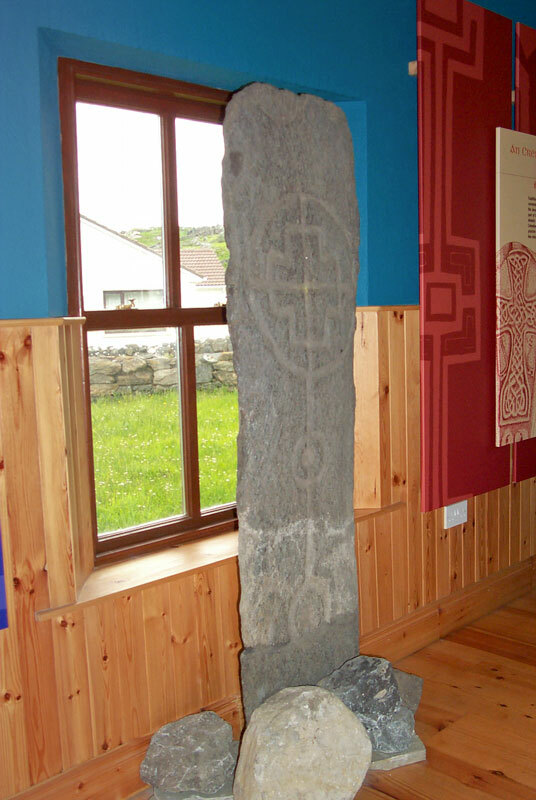 The 1.6 meter (5.25 feet) pillar, standing in a small cairn, is a fiberglass reproduction cast from the damaged original stone, which has now been reassembled and is displayed in the village Folk Museum. 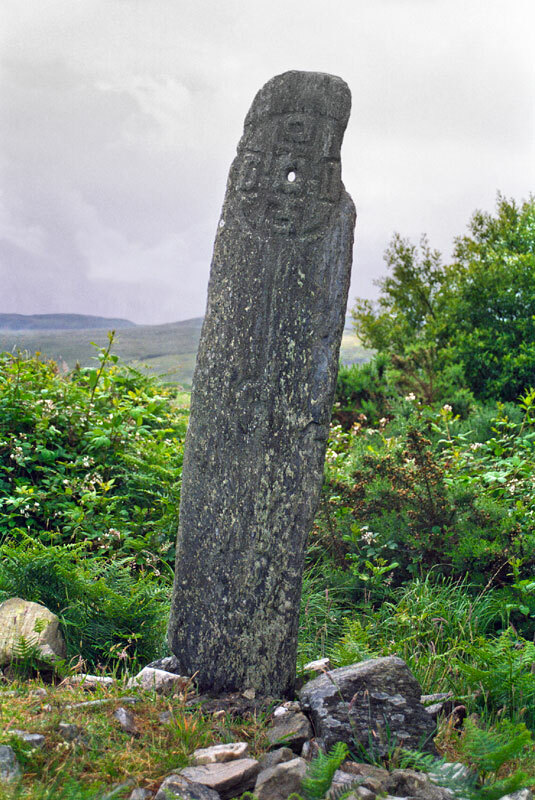 The decorated side of the pillar faces east, toward the pilgrims as they approach from the Townland of the Demons. At this station the prayers recited are three Our Fathers, three Hail Marys, three Glorias, and the Creed. After walking 400 meters (437 yards) south from Station Thirteen, the pilgrim crosses the river Muirlin by stepping stones and then approaches Station Fourteen on a rocky prominence just south of the stream. 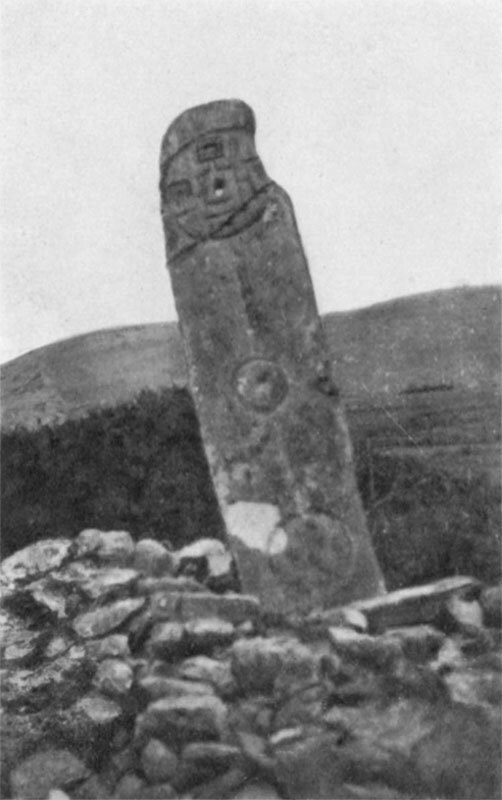 There is a decorated slab, 1.1 meters (3.5 feet) high, standing on a leacht. It is decorated on its north-east face. The pilgrim recites three Our Fathers, three Hail Marys, three Glorias, and the Creed. This station may be reached more easily by a path leading from the rear parking area of the housing estate to its south. Pilgrims again cross the river Muirlin and then head up the hill back to St. Columba’s Church where An Turas began. In the Catholic (east) section of the church graveyard there is a now-broken pillar that was 1.8 meters (5.9 feet) tall when it was whole. 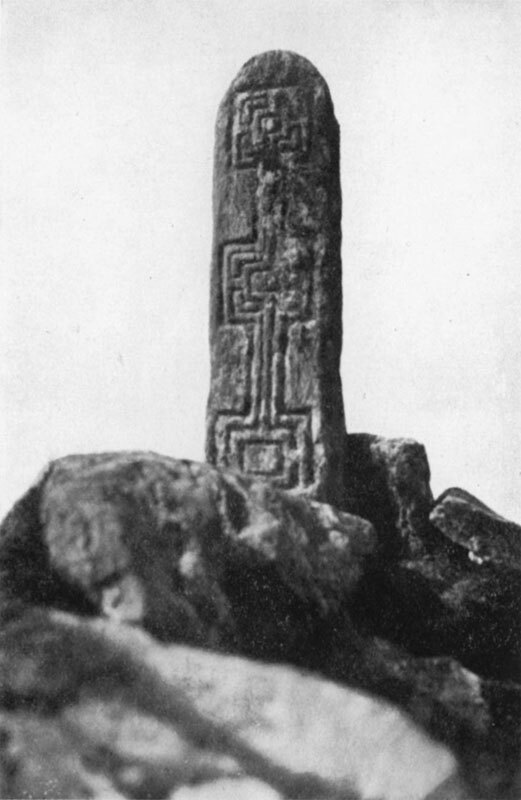 The knotted-ribbon patterns, and the complex key designs on the top section of the stone are unusual among the cross pillars. Cunningham, Gerard. 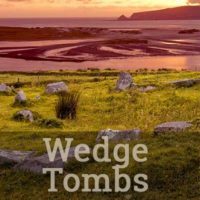 Turas Cholm Cille – A Pocket Guide. Dublin: Faduca, 2010. Harbison, Peter. 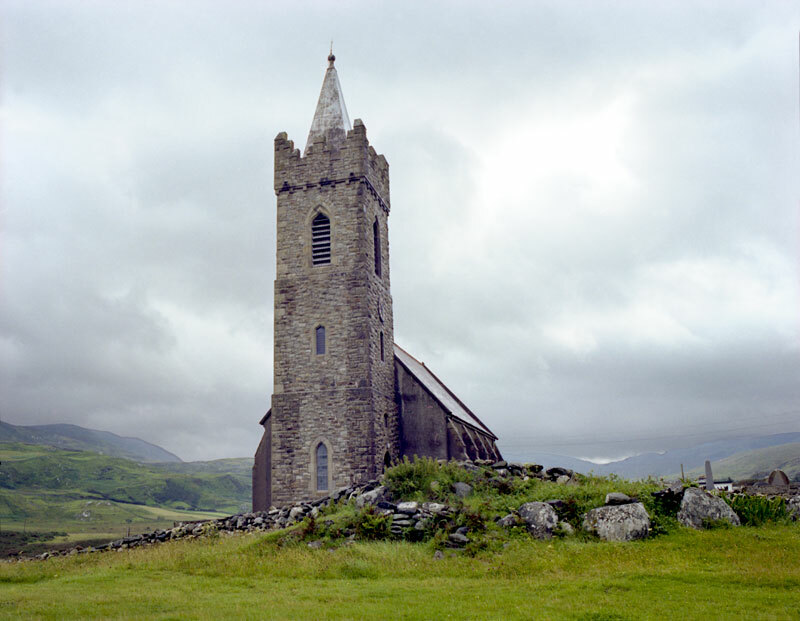 Pilgrimage in Ireland: the Monuments and the People. Syracuse, NY: Syracuse Univ., 1992. Herity, Michael. 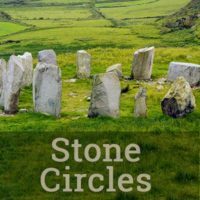 Gleanncholmcille: A guide to 5,000 years of history in stone. Dublin: Na Clocha Breaca, 1998. Price, Liam. 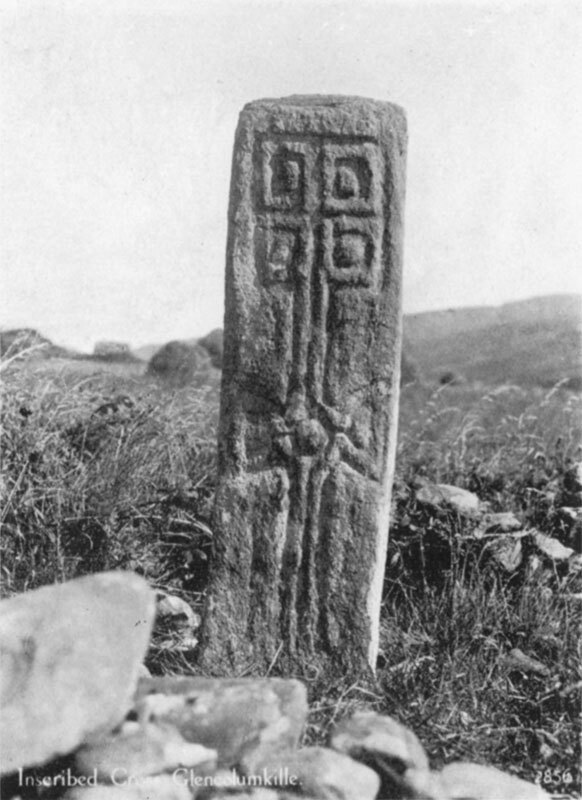 “Glencolumbkille, County Donegal, and Its Early Christian Cross-Slabs.” The Journal of the Royal Society of Antiquaries of Ireland, Seventh 11.3 (1941): 71-88. 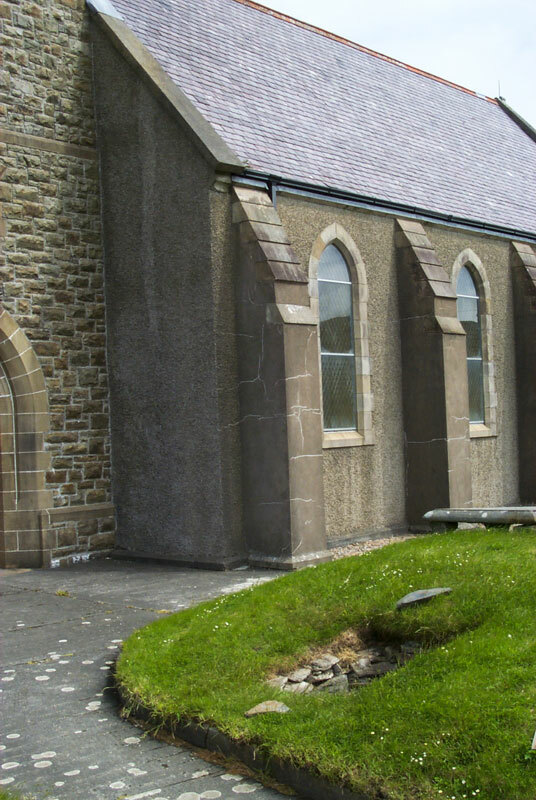 During the 30 years that our six visits to Gleann Cholm Cille have spanned, a number of locals have kindly offered their assistance with this project. Paddy Beag Gillespie and Jimmy Carr, who have each been leaders of Turas groups, have been generous with their time. They are the Erenaghs, the inheritors of the traditions of this valley. 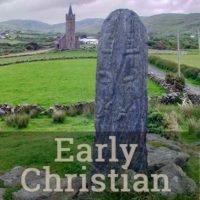 Séamus McGinley has been a careful reader of the text for this site. Paul Cunningham was most helpful when we walked and videotaped the Turas together in 1998. Other members of the community, now deceased, were very helpful in years past: Paddy Byrne, Bridey Cunningham, and John McGuire. On each visit to Gleann we look forward to visiting Oideas Gael and spending time with its indefatigable founder, Liam O’Cuinneagain. He has provided indispensible guidance and suggestions for both the text and the media for this project, suggestions which have made it better at every station along the way.